Lectures and tutorials started back this week after a two week break and magically, my week cleared out to make room. It’s the pointy end of the semester now: there are only two weeks of lectures left, and I have two major assignments due the week after that. And then my first semester is finished! Sitting within the spaciousness of this week, with all the time in the world to do what I need to do, I couldn’t help but notice the vibe of next week; if I listen closely, I can hear the band playing and the cacophony of a party well in swing…I cannot believe how much the Universe has decided to squeeze into one week. I say the Universe, because I am not in charge of next week’s schedule. These are just things given to me fit in, and because most of them are things I want to do, I am not complaining. No way :). One child does martial arts every Monday, cricket season is beginning next week for my other child with a Tuesday training and Saturday game, not to mention music classes for both of them every second Friday. There is an appointment with our beloved but vociferous accountant on Wednesday and an all day work related course an hour away on Friday. Most excitingly though, I have a dear friend coming to stay with us for four nights on Thursday. I haven’t laid eyes on her for about three years, and the last time she came to visit was when we first moved here, about 12 years ago. I met Cheryl when I was 21 and had just moved to Sydney to study Homeopathy and Nutrition at Nature Care College. She was also a student of Homeopathy, and we soon became fast friends. We did all kinds of things that single girls in their early 20’s do, none of which I care to share here, bonding over homeopathy assignments, late night drinking escapades and boy dramas. In fact, it was through her that I met the Bear. Cheryl had found a new man, who just happened to be the Bear’s oldest and best friend. After a while, they began dropping hints about what a good match the Bear and I would make; he was going through a bit of a rough patch, they said, and could do with a woman like me to shake him up. Little did they know, this kind of description added about six months onto our meeting time – I am not a rescuer, you see. The Bear was also resistant – he had no desire to be match-made by anyone thank you very much. Finally though, we did meet – three months later we packed up and moved out of the city and the rest is history :). Cheryl and the Bear’s best friend broke up not long after we got together, causing all kinds of trouble – but I guess in the end they had done what they had needed to do. So, my delightful South African friend with the curly hair, wicked sense of humour and a heart that is too big for this world, is coming to stay. Yippee! Breathe in for the count of four, hold your breath for four, breathe out for the count of four. Repeat four times. When you have finished, ask “How can I connect more deeply to Source?” and then wait for an answer. So, I have been working with this breath this week, whenever I think of it – maybe four times a day. The answers to the question at the end have ranged from messages like watch the breath, paying close attention to the spaces at the beginning and end to an image of making biscuits and a batch of home made cordial with my daughter. Which I duly did :). I did this breath before responding to a financial correspondence and received an image of a doctor operating on a patient, with the message this is a delicate matter that requires finesse. Go softly. Try it and see – it’s a wonderful way to connect to the flow of life. And then it gets better. Go read it <3. In my writing subject (travel and genre writing) this week, we had a wonderful guest lecturer, Helena Pastor, who has both just published her first book and is giving the final touches to her PHD, from where her book arose. What struck me as she was describing her book and the process she used to research and write it, was that here was yet another pathway to writing, which I hadn’t considered – the academic pathway. It wasn’t a dry, academic book though; her book follows the lives of some troubled boys and their inspiring social worker who guides them through adolescence. At the same time, her eldest son (of four boys) was going off the rails himself, which took the book into unexpectedly personal territory. Fascinating huh? Check out her book, Wild Boys, here. I received my marks for my second assignment for the same subject this week – 83%, which is my best mark yet :). Happy days! Now all I have to do is write the short story – a 2000 word travel piece. I am using Scrivener (a piece of writing software) to write it in – I wouldn’t say I am an expert in Scrivener, but I do use it and find it helpful, especially for things that I have planned out. In fact, as I grow into my writing boots, I realise that I am what the writing world calls a planner, as opposed to a pantser :). The advice I have received in both assignments is show, don’t tell. I was thinking about my tendency to give too much away yesterday, and I think it’s probably connected to my desire to be understood. I have developed a very clear and concise way of communicating to avoid misinterpretation – both verbal and written, but it appears that this is not the way to tell stories. I’m working on it :). In my media subject, we are learning about Reality Television and the role it plays in modern television programming and our culture. Is it all about the voyeuristic pleasure we get from looking at other people’s lives, the delight we take in other peoples’ suffering and victories and the lowest common denominator – or is it about the democratisation of television, where anyone can have the opportunity to be famous, if for only 5 minutes, and where we can see our own lives reflected back to us? The lecturer used the examples of Masterchef and MKR (two successful reality cooking shows in Australia) and asked us to analyse their promotional clips for the 2015 seasons to see how they were presenting themselves and to what audience. I find it very interesting to look at media in this analytical way, although I feel that I may never be able to consume media in the same way after this degree :). Check out more of Marabeth Quin’s beautiful art here. My own theory about Reality Television is that it plays into our need to be validated. I’m no expert but I did work in television for 10 years. And obviously, now, I live under a rock. Did not know that Wayne Dyer had passed! Thank you for telling me. I read his first book in 1976 and it set me on a path of self discovery and opening myself up to new possibilities that has never stopped. Vale Wayne Dyer. That is an interesting observation about story telling, to show, not tell. I’ll keep that in mind, because I think I tend to tell too much also, for much the same reason as yourself. Have a lovely Father’s Day and week, Sara. Oh Ardys, and I was the one to break it to you with my sledgehammer sensitivity! Along with telling not showing, one of my Taurean specialities :). Congrats on getting through the first semester! Glad it went well. Now time for a nice break. Sad to hear about Wayne Dyer passing on. He is an inspiration. Yes, he was an inspiration – he has certainly made a difference, that’s for sure. I haven’t finished my first semester yet – I still have three weeks to go, but the end is in sight! Ticking off the assignments, semesters in sensible, practical increments seems a satisfying way to approach adult learning, as well as applying it to the everyday. Reality TV somehow in some way touches us all, even if it’s simply, briefly media snippets. I think for many TV is a means of connection, some people are far more familiar with the personalities on the screen than in real life. I like TV but selectively, and as with all media am pleased it comes with an off switch. If only other aspects of life that we might need a break from could be navigated so. Lovely to have a friend come and stay. While at TA we had a visit from a blogging friend, now plainly a friend and during the week an unexpected text from my bestie who lives in Canberra asking if I was free for coffee. She was in the CBD in my office neighborhood unexpectedly and with unforeseen half hour for a catch up. Of all the writing things I’ve taken in recently ‘show, don’t tell’ has been the most useful. I added the 3 breaths you mentioned previously to my morning ritual, the 4 will be a much needed grounding tool during the day… sometimes I just need to stop and wait things out, I think. Yes, your insights about television, reality tv and celebrity are spot on – some people feel so disconnected from their communities that they feel more connected to the people they watch on the screen. I don’t mind tv either – it certainly has its place in our house. The off button is used frequently though – I have taught my children to be discerning watchers, by which I mean that they turn the tv on when there is something on that they like, and then turn it off when they’re done. It amazes me that people don’t turn it off, or they sit there and watch something they don’t like rather than turn it off. It’s not the first time I’ve heard ‘show don’t tell’ – it is something that is mentioned often at my writer’s group…but it’s a new thing to have critical feedback on my writing, and interesting to have that instruction applied to me personally. I was wondering how i would take criticism, being thin skinned and all 🙂 but it’s been fine. More than fine, I’ve enjoyed it. Keep breathing Dale <3. Have a good week! Doesn’t time fly – it seems such a short time ago that you were considering going back to school and here you are nearly at the end of a semester. I find the James Rhodes article so inspiring – it’s such a shame that so many people let go of their creativity and regret it without trying to get it back. I know! It all seemed to move kind of quickly in hindsight…and now here I am at the end of the semester :). As for creativity, it’s a topic that really interests me…for me it’s all wrapped up in integrity and authenticity. Are we living the life that we want to live, and if we are not, why? Thanks for the breathing exercise…I especially like the question at the end. I’ve been working with something similar – 4, 7, 8. Same idea – different count. And without the question at the end. I’ll add in the question and see what arises…I always love a little insight from within! Yes, do try – using the question has been particularly useful this week. 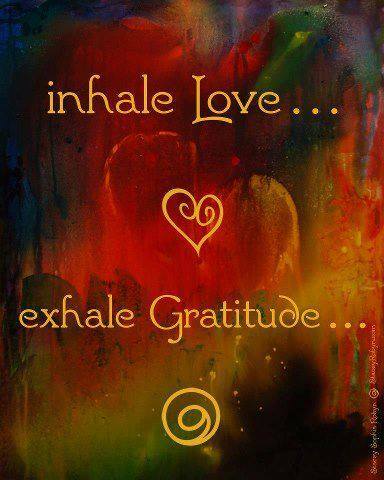 Love the breathing! And the quote. What subtle, profound, joyful, peaceful messages and experiences there are to be found in the breath. I have been playing with similar, where you breath into dilemma, query etc. Once centred, then journal – writing with your non-dominant hand. Messages and responses of unexpected, simple, important perspective have flowed forth. All in a messy scrawl on the outer – but a inner knowing non the less! Sounds as if you too have been Busy Busy!.. that 444 breath I will give a try.. I am a big believer in breath work, and do a lot of deep breathing in my Qi Gong exercises.. Yes I am sure Wayne was welcomed home with open arms and much celebration to his mission here on Earth.. I know I will miss him.. but I have lots of his books upon my shelves and even a set of tapes with his lovely voice giving one of his many talks.. I hope you had a wonderful reunion with your friend and a lovely weekend Sara..